I tried to use my axe to do the job but I was wasting my time, I might as well have been bouncing a ball on the wood for all impact it made. 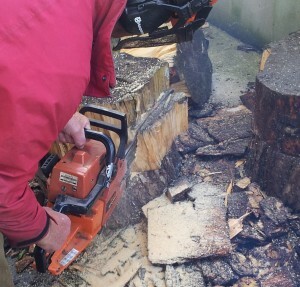 I considered renting an electric wood splitter from my local hire shop, but they only had one and that was waiting to be repaired. So instead my local hardware shop, Ted Johnsons in Naas, educated me in the art of splitting wood and the tools required. They calmly explained to me that the axe I owned was for cutting down trees and what I needed to split wood was a maul (splitting axe), and perhaps a grenade and a sledge hammer. What is a maul? This is a much bigger and heavier version of an axe. 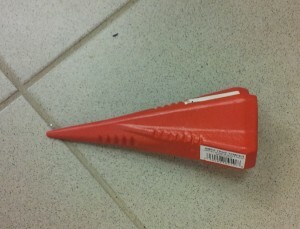 It has a heavy head and a longer shaft. 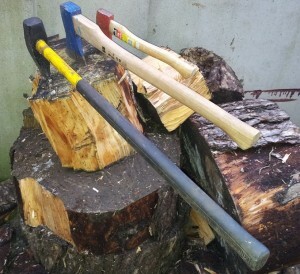 See photograph of my newly bought maul and my other axes lined up. This shows the difference in size, although not weight. What is a wood cutting grenade? A grenade or torpedo is a heavy iron wedge with a pointed end. This is designed to split well rounded logs into 4 quarters. 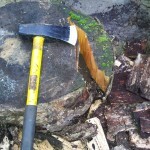 A sledge hammer is used to drive it into the centre of the timber, which causes the timber to split into 4 sections. It has a slight twist which aids in the splitting of the wood. Many other types of wedges are available. The advantage of wedges is that you can hit the timber in exactly the same spot over and over again. They are particularly helpful with bigger, tougher pieces of timber. I brought the maul home and it made a huge difference. 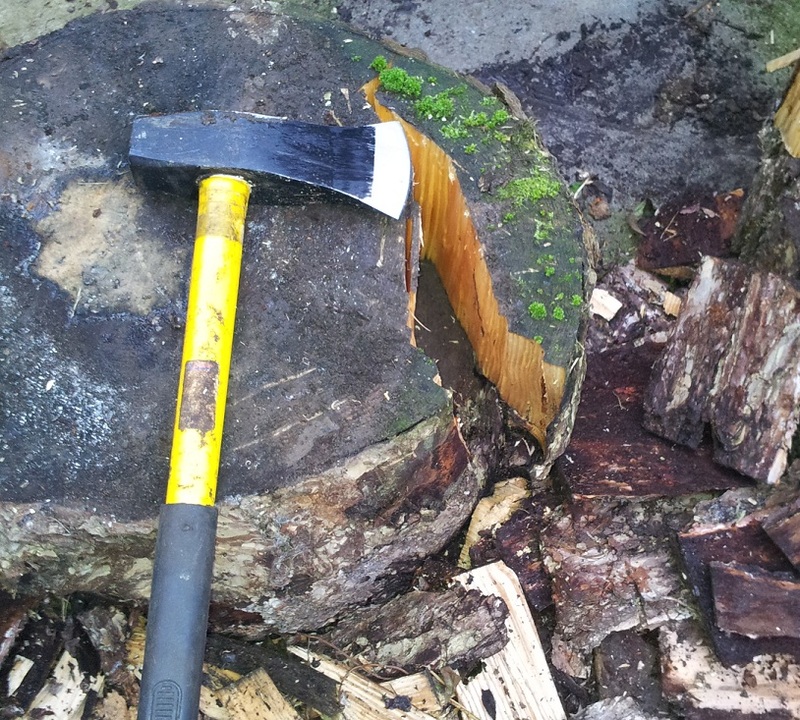 I was able to cut the large pieces of wet timber with reasonable ease, by starting at the edge and working inwards. There is a knack which helps as well, of pointing the head slightly outwards when hitting the timber. 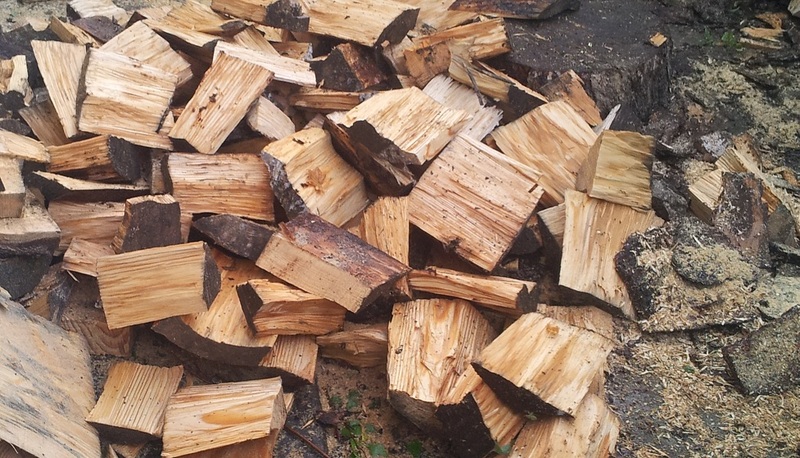 I ended up with one or two problem lumps of timber caused by knots, and a chain saw was used to cut these pieces up. However the chain saw was much slower and dirtier than using the maul, as it was turned some of the firewood into waste saw dust. By comparison there was no waste with the maul. It’s hard work cutting wood up and it gives you great exercise. Once done you are more interested in cooling down than using the wood to light a fire. Remember to give yourself plenty of space before starting work and ensure there are no kids, people, animals etc close by, as some pieces will go flying. The wood grenade wedge does not split rounds/logs into four pieces. That is an advertising myth. In fact, with the pointed edge, it is quite poor at opening up a round when used with a sledgehammer, because as it is driven into the wood, it exerts force in all directions. Dissipating the force this way makes it harder to split the piece. On the other hand, when a wedge with a blade is used, it is far more effective, because it opens up the round along one line, thereby concentrating the force that is applied. I discovered this by practice and found that using a wood grenade was harder work than it ought to be. It is fine when the round is well opened and the wood grenade is then used to complete the split.